A class of Hunter news literacy students visited the sprawling Bloomberg LP headquarters at 731 Lexington Ave. on Nov. 9 for a recitation on how the enormous news-gathering operation determines what the top stories of the day are and how its thousands of journalists address such news-literacy staples as verification and independence. 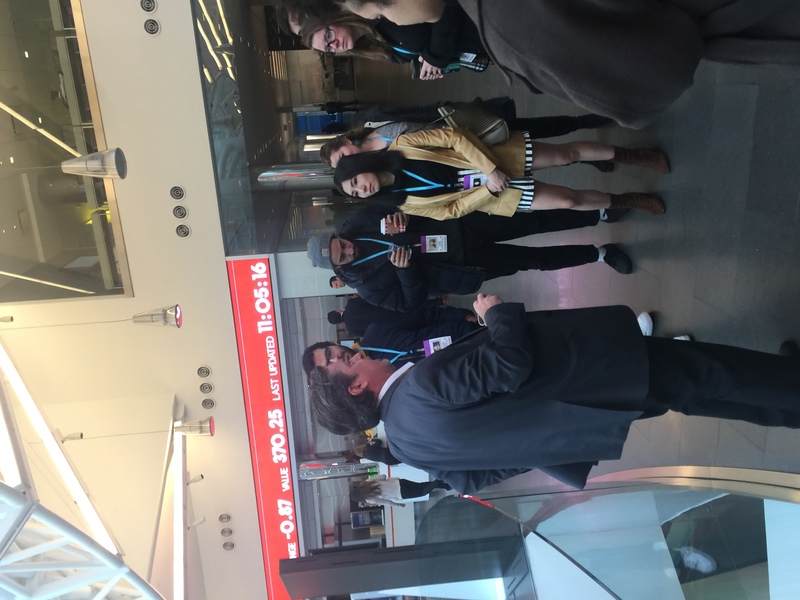 Bloomberg financial news journalist Rob Urban (left) tells Hunter students about the company in its HQ on Nov. 9. 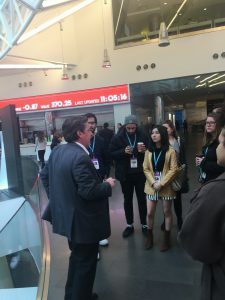 Rob Urban, who has reported for Bloomberg for more than 25 years, told the Hunter delegation that Bloomberg’s reporters around the world follow the same code of making sure that a story has multiple sources and doesn’t contain a bias. Urban, who has been based at various times in such places as Russia, Eastern Europe and now New York, stressed that the company’s journalists value an intellectual curiosity and a hunger to find informative and interesting stories that will set Bloomberg apart from its primary competitors, The New York Times, The Wall Street Journal and the Financial Times. Today, in a climate when the president of the United States proclaims that journalists are the “enemy,” it is essential for student journalists to understand the crucial mission of their chosen profession: to inform the public without fear or favor. 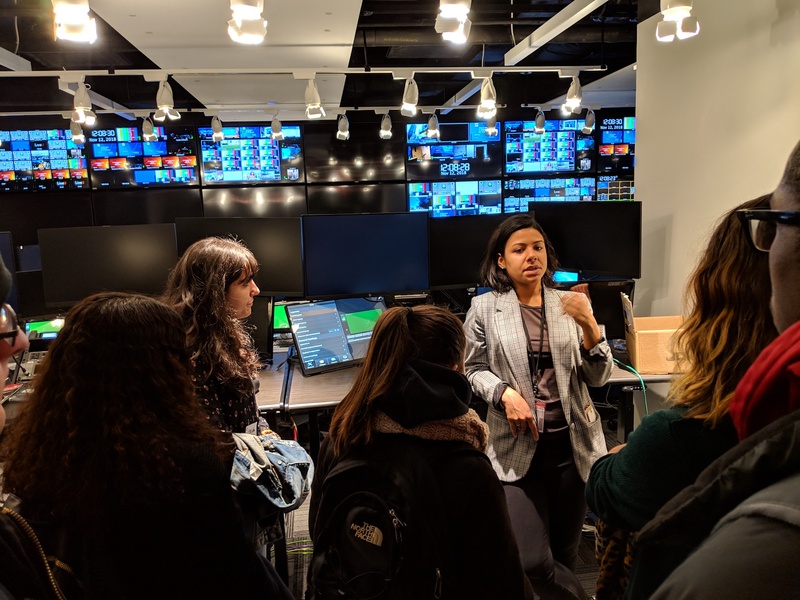 Urban and some colleagues who joined him for the tour also made it clear to the Hunter class that the kind of business-oriented journalism that Bloomberg focuses on is not dull, contrary to any preconceived notions about financial news. This is a commonly held belief: reporting can’t be interesting if it involves numbers so heavily. In keeping with news literacy, this is an “assertion” and it is false. Urban pointed out that Bloomberg editors value stories that tell people’s stories. Every story can potentially contain a strain of drama because every “business” story affects people, ranging from pieces about personal finance and tax changes to municipal bonds and politics. Bloomberg News, a division of the parent company that Michael Bloomberg established in the early 1970s, has an interesting story all its own. Bloomberg, who made millions on Wall Street before founding his own entity to provide information for finance industry professionals, formed a news division in 1990. At first, it was so primitive that reporters had to rely on other media to report on Desert Storm in 1991 (according to Bloomberg lore, some reporters went as far as sticking transistor radios out of a window to pick up a connection from the station WINS to keep up to date). But under the direction of founding editor-in-chief, Matthew Winkler, Bloomberg News doggedly followed financial news and eventually caught up to the likes of The New York Times and The Wall Street Journal in terms of news-gathering prowess and its reputation in the media industry. A sign of the company’s sophistication was its growth during the time that its leader and founder, Mike Bloomberg, served as the mayor of New York for three terms earlier in this century. Nowadays, the Bloomberg headquarters can resemble bustling Penn Station during the afternoon rush hour, with lots of people racing around furiously. Bloomberg also offers employees (and Hunter visitors!) free coffee and other beverages and all kinds of snacks. 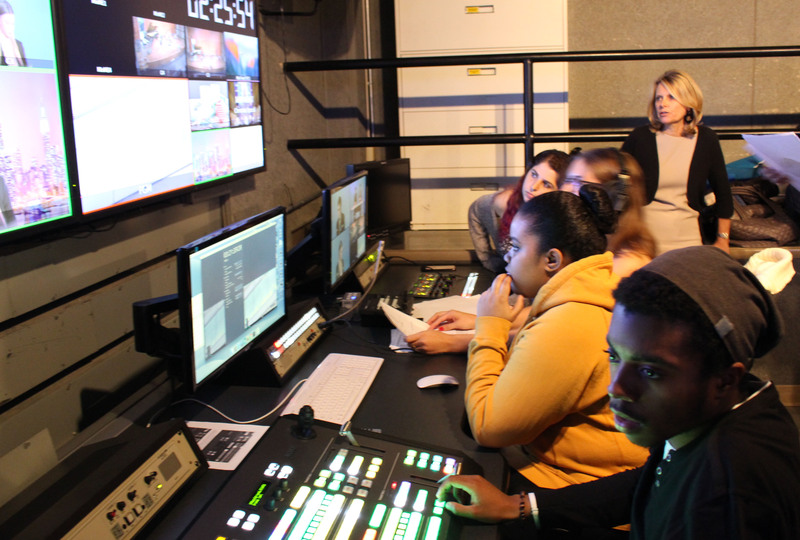 All in all, the Hunter class had the benefit of going beyond studying news literacy in their classroom to speaking with journalists who live it everyday.